We are just weeks away from having a new little baby joining our family and with that we need a spot for them to sleep. The thing is there are just so many options. The only thing I know that we won’t be doing is buying a new crib until we move into a new space. Our current home is just too small for a crib and let’s be honest if this babe is anything like the last two they won’t be regularly sleeping in a crib until at least a year (or even later). So we had an Arm’s Reach Mini Co-Sleeper with Alder and while we liked it and even included it in our newborn favorites post I have to say that I am not quite sure it is what I want to buy again. Why won’t I buy it again? Honestly because I would prefer something a little more aesthetically pleasing. Functional, great quality and worth the cost? Yes, but it’s kind of ugly. So now the big debate is on what should we buy? I’ll be honest as I prepared this post and went back through my list of options I really narrowed down what I liked based on look, cost and functionality. I’ll include the semi-finalist at the bottom of this post and please let me know if there are any others I should check out. Chicco Lullago Travel Crib: This was actually on my lust list back when Alder was a baby but at the time it wasn’t available in any US shops. Now you can find it on Amazon, at Target and tons of other retailers. Reviews: This gets positive reviews for the most part. People really love the size, the portability and it’s sleek. Things to consider though is that it folds in the middle which may be uncomfortable for baby, you will need to buy sheets, and you will most likely want to purchase a mattress pad to go on it. Moses Basket + Stand: A moses basket, specifically this one from Plum + Sparrow, is high on my wishlist it’s just convincing Neil that it’s worth the cost. I love the look of it, I love that I can take it from room to room and that it can be used as a safe place to put baby down whether it’s to sleep in our room at night or in the kitchen while I cook. I just love it. I also see it as a great basket for the kids playroom to put all their stuffed animals and baby dolls in once baby #3 grows out of it. In addition to the basket a stand is a must to go next to the bed. Portability: Easy to move, packs up and can travel with it. Length of Use: 3-4 months, 20 lbs and/or when baby can roll over, push up or crawl. Whichever limit comes first. Reviews: Overall moses baskets are popular and this specific basket from Plum + Sparrow is well loved across the blog world right now. I love that every basket is handwoven and unique. The biggest con for this option is the cost + the length of use. DockATot: The DockATot is probably one of the hottest baby products on the market right now and for good reason. The DockATot helps when it comes to safe co-sleeping. 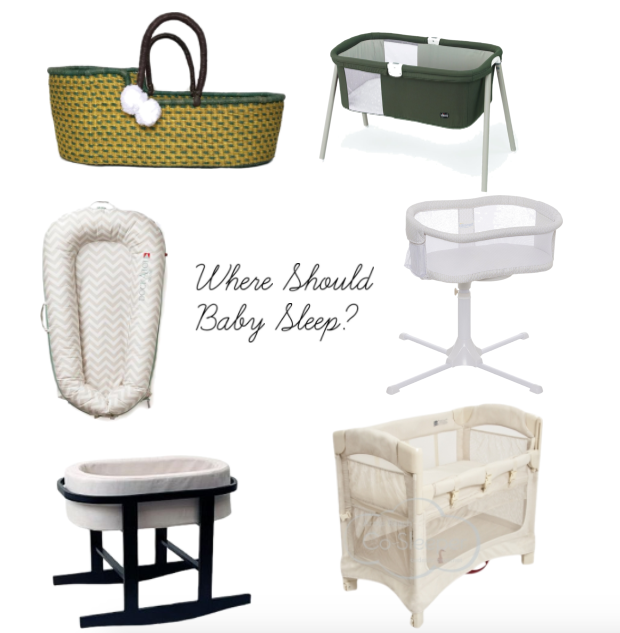 Considering I know that we will be co-sleeping this is on the must buy list rather than I really wish we could have this list. Portability: Easy to move and can travel with it. Length of Use:ages 0-8 months old or 5-22Ibs. Reviews: Everyone loves it. That’s basically it. Babyletto Origami Mini Crib: Mini crib that is perfect for small spaces and can be used up to 18-24 months depending on your little one. HALO Bassinest: Very popular especially for nursing mamas and those mamas recovering from c-sections. Monte Ninna Nanna Bassinet: Basically a gorgeous bassinet that I would love to own but it is incredibly costly. Arm’s Reach Mini Co-Sleeper: Former love of mine but just not on my wishlist list for this baby but still well loved.